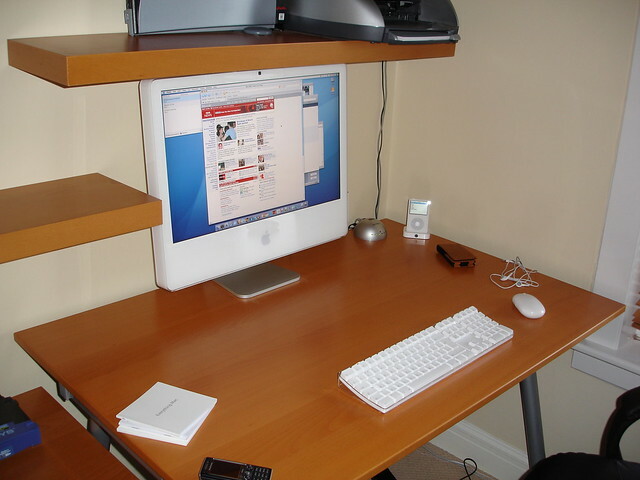 Hard to believe but it’s 10 years since I moved from PC to Mac. 10 years! I’d been using an iPod for a few years when in 2006 Apple moved to Intel processors and updated their iMac design. It was all too tempting so I said farewell to viruses, tara to malware and hello to hassle free Mac computing. That was the plan and for the most part it’s been true. Here’s some thoughts on my Mac/Apple journey inspired by this post from Elaine Giles earlier in the year. I loved that first iMac and picked up an 80Gb iPod at the same time. The first three months was so good that at Christmas I bought a MacBook Pro. What a great laptop that was. Fast, quiet, quick to boot and the design was to die for. 2007 saw the release of the iPhone but it just wasn’t for me. No 3G, no app’s. It was a lovely first phone but not enough to make me move. So I stuck with my Sony Ericson, remember them, and waited for Apple to update their Jesus phone. 2008 saw Apple release the iPhone 3G, iOS 2.0 and the App Store. I jumped in and picked up a 16GB iPhone 3G and bought far too many app’s on day 1. Super Monkey Ball, MotionX Poker and Twitterrific were all stand out app’s even in those early days. The iPhone and success of the App Store started a shift in focus for Apple, developers and consumers. Subsequent iPhones increased in power and performance and I lapped them up. The 3GS, the 4 and 5 all followed and unlike other phones they kept their value in the second hand market remarkably well. In 2010 Steve Jobs revealed the iPad. I still remember myself and Shak both dismissing it as a big iPhone…and then a few weeks later queuing for one at the Apple store in Glasgow. For me it was definitely a consumption device. Magazines, books and comics all worked really well on the iPad especially the retina model which came out in 2012. At the end of 2013 I moved to an iPad Air which I still use today. I tried a couple of keyboards during the various iPad’s I’ve owned and went through a few different styluses but none really stuck. I did do a few work related tasks on them but the iPad remained mostly a media consumption device. When the iPad Pro’s came out I was close to picking one up but stuck with the Air mostly due to the cost and initially being unsure of the 12″ iPad Pro. 2014 saw me move to the iPhone 6 and this year I picked up an iPhone 7. It’s a fantastic phone but it feels the end of the line with a redesign likely next year. Competitors are using better components and catching up on the camera front…and many feel their phone camera’s are now better than the iPhone’s but at least the iPhone doesn’t explode. 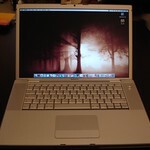 So iPhone and iOS has become the focus for Apple but I still love the Mac. May 2011 and I upgraded to a new iMac. This was a great machine – 27″ screen, SSD and really fast processor. In fact it was so good (after a 16GB RAM upgrade) that over 5 years later I’m still using it. It still copes with most things I throw at it although there are two main shortfalls. It really struggles to process 4k video which both the camera and drone support and secondly it’s not a retina device. This is also true for the MacBook Air I picked up in 2012. Non retina and not in any way a powerhouse but it does the job for me in a few key area’s that the iPad Air doesn’t. So apart from the iPhone my other Apple products are all getting long in the tooth. I almost forgot – 2015 and the Apple Watch. It’s been OK and Watch OS 3 makes a big difference but I’ve not moved on to the latest version until I see some app’s that will make a difference. I don’t need a faster CPU to get a notification more quickly. The main reason I haven’t updated the Mac’s is mostly thanks to the slow progress that Apple have made with Mac hardware. Certainly the move to retina is great but if I look at the current Mac platforms, they are all old. Buy a Retina MacBook Pro today, which is probably their flagship Mac platform, and the hardware is over 500 days old. That’s shocking. How many people are buying a Retina MacBook Pro today not knowing that the inner hardware is that old. Same for the MacBook Air although I’m assuming sales of the Air are now very small – the bezel looks dated and it’s a non-retina screen. The Mac platform is clearly secondary for Apple. The Mac App store is a mess in comparison to the iOS version. The latest Mac release, Sierra, has very little for Mac users. Compare Messages in iOS which saw a massive upgrade in iOS 10 to the Messages in Sierra. Crickets. And where is the hardware from Apple that would support any sort of VR headset? If you are in any way interested in the Oculus or Vive platforms then a Windows PC is the only option. Over the next 18 months I’ll be replacing my iPad, MacBook Air and iMac…and probably my iPhone too! With iOS and iPhone I have no complaints and I love the platform. My current thinking is that I’ll replace the iPad and MacBook Air with an iPad Pro. No idea on size, but the keyboard and Pencil support of both Pro models will leave me needing only one device to replace the current iPad and Air. As for the iMac, that’s a more tricky decision. My gut feel is I’ll update to the latest Retina iMac and sufficiently future proof it with fast CPU, SSD and lots of RAM. However I don’t think I can ignore Windows for much longer so I can see me also picking up a 4K second monitor (to replace the current non retina 27″ ASUS) for the iMac and plug in a Windows gaming PC that will allow me to play with one of the VR platforms. That purchase will wait for one of them to be seen as leading as at the moment it’s early days in the VR space. I depend on my Mac, more than the iOS devices, and it’s where I get most of my work done. Unless iOS devices and iOS itself see’s some significant changes I won’t be able to shift to being iOS only so I do hope that Apple release updates to Mac’s soon – the platform needs some love! Despite my negativity I won’t be leaving the Mac though. Even some stale hardware and unloved Mac updates are better than Windows 10 and it’s woes. Here’s to the next 10 years with Apple. 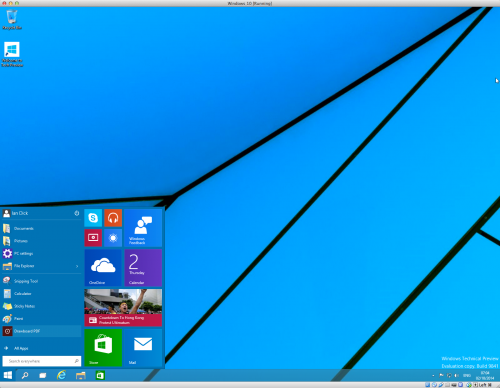 Microsoft surprised everyone by announcing a new version of Windows and calling it Windows 10. There were lots of rumours of a new version but none predicted that name. Why 10? To get away from 8, to make it sound really different, to align with Mac OS X? 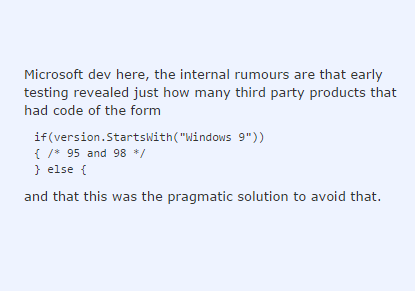 One rumour yesterday linked it to Windows 95 and 98. Windows 10 won’t be out until late 2015 but there is a technical preview available and credit to Microsoft as they’ve made it available as a downloadable iso image so it’s easy to install as a virtual machine via VirtualBox. On first run Windows 10 shows you a desktop that looks familiar to all Windows users that bizarrely was missing from Windows 8. 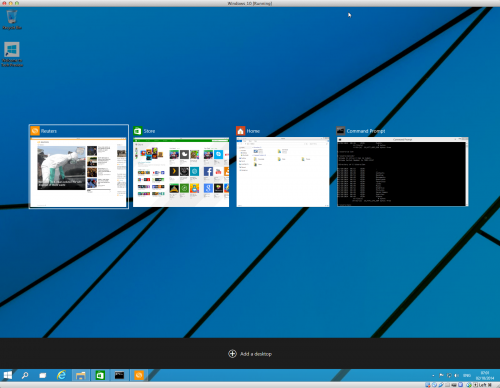 A desktop with a start menu that you can launch app’s from, search from and easily power down your Windows device. 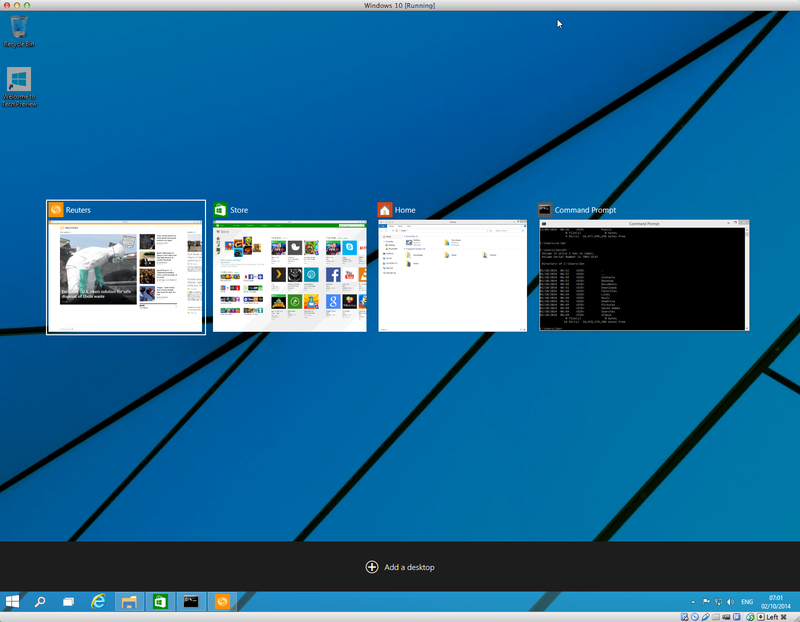 In fact it looks like Windows 7 with a new theme apart from one thing – tiles in the start menu. There’s a few other tweaks here and there but when you see it running you’ve got to wonder why Microsoft just didn’t update Windows 8 to have this view. That’s another year for Windows 8 users to suffer from some fundamental usability issues. But don’t worry, Windows 10 will fix it. Task switcher in WIndows 10. Expose? A couple of other changes. Firstly there’s a task switcher that brings up a view not unlike Mac’s Exposé and is pretty useful when you have lot’s of app’s and windows active. The other is search. This feels like Mac’s Spotlight or tools like Alfred or Launchbar in that when you search for something it will search against app’s, documents and internet sites. Handy and seemed to work well when testing this morning. That’s about it so far from my brief play. I had to launch a command prompt just so I could confirm that cut, copy and paste finally work. 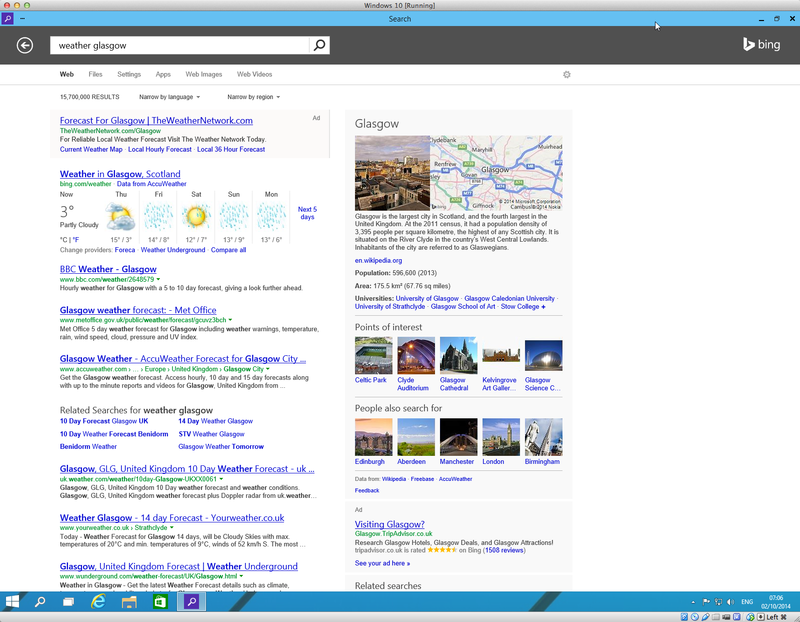 Such a small change yet it got mention at the Windows 10 soft launch this week. Weird. Microsoft have a lot more to show over the coming months but the emphasis so far on enterprise is almost a plea. Don’t leave us, we know where we went wrong. Windows 10 is ambitious in that it’s planned to be one platform across all of Microsofts devices – mobile, servers, desktops, laptops, tablets, large surface devices and Xbox One. I fear compromise again which is at the root of many of the problems in Windows 8 but Windows 10 looks to be a good start on desktops and laptops at least. Busy weekend that was mainly indoors due to the quite lovely weather outside. Give me cold and dry any day over this wet and windy nonsense. It did get off to a great start when four parcels arrived Friday/Saturday. While not quite as good as the instant gratification of buying form a shop the fact I’d saved some cash with these purchases made it all seem a little sweeter. First parcels were the rest of my hill walking gear. That’s me pretty well set now for the first walk 2 weeks today, a 6 mile jaunt to break everything in. The following weekend is a 12 mile walk which will be slightly more challenging. I can’t wait! Really looking forward to getting out and about. To help I’ve also picked up a couple of books including a cracking little pocket book of 40 walks close to Glasgow. A new piece of tech was also in one of the parcels – a Bamboo Fun graphics tablet. One of my work colleagues has used one for years and I’d always been tempted. Seeing Shakeel use one over Christmas convinced me of their value. I’ve been using it today to process my London Eye photo’s in Lightroom and it is so much easier, offering far more precision than the mouse. While not essential I’m really pleased with the purchase. More tech geekery – I’ve switched back to Windows 7. Can’t believe how much improvement over Vista and XP this is. So much so I…..nah – I won’t be switching back 😉 But I was impressed with it once I had it installed using Parallels 4. Quick to boot and shutdown compared to XP never mind Vista. It also looks pretty sweet. Not done to much more with it but will probably remove my XP virtual machine and use this instead. Apart from that I started a nice new project for work that hopefully won’t take too long to finish off and I’ve caught up with the Screenwipe review of the year which was class. 24’s back tomorrow, Battlestar next week, Lost at the end of the month and FX is showing The Wire from Feb 23rd which if you haven’t caught yet should be added to your diary. Unmissable. Oh, almost forgot. Tried Spotify today. Very impressive. Reminds me of Pandora before it stopped working in the UK. And finally, I think. Macworld. Kind of quiet but iPhoto and iMovie 09 look to be very good upgrades so I’ll probably be upgrading at the end of the month. DRM free iTunes is good but it’s been a long time coming so doesn’t seem such a big deal. Even the Macbook Pro was fairly tame except for the non replacable battery. If that option plus the matte screen was available for the 15inch Macbook Pro I’d really consider upgrading. Thankfully it’s not! I prattled on the other day about backups and how SuperDuper is now out for Leopard. Since then Shaun Blanc has published a superb post on Bulletproof Backups. It’s a great read like most in his Mac Software Reviews (Coda is a great example). Open source is good. Usually. This list of 50 Proprietary Programs and their Open source Alternatives has already delivered a couple of nice programs that I hadn’t heard of before. 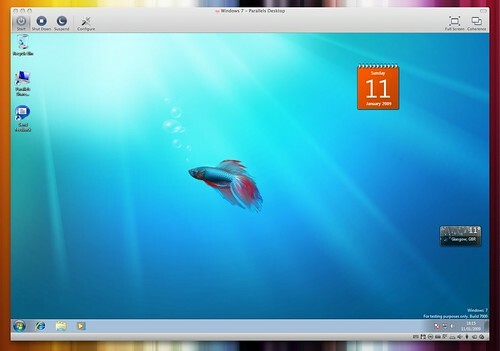 For Windows, Mac and Linux users. Everyday Shooter is finally out this week for European PS3 owners. It’s only about 4 months after the USA release and while I appreciate it can take time to add languages the delay has been pretty sucky. Looking forward to it all the same. PS3 has got a great crop of arcade style titles now – just need to sort out their full price catalogue. This week is my last week working for engineering at my current firm. From next Monday I’ll be working in IT, mixing analysis with a bit of hacking. For my sins I now have a laptop at work and boy do I miss my Macbook when I’m using it. I don’t think the hardware’s really to blame. It’s Windows. Well, maybe it’s both. Wireless on the PC is really flaky so much so it’s blue screened a few times, something I hadn’t seen in a long time. Sleeping/waking is also an issue for the PC compared to Mac. Even though the PC is newer and has a better spec than the Macbook it’s really slow in day to day use, probably down to the security software on the PC and stuff like Becrypt. It will be interesting to see how it pans out over the next few months but in 4 days it’s reinforced my Mac loving opinions. Still, looking forward to new job. In fact, I can’t wait! New Leopard update out tonight. Lot’s of fixes (> 300 Mb download) and just when you think thats the last update there’s some new graphic drivers to grab as well. Nice to see them addressing stacks list view and transparent menu bar (some of the biggest grumbles on Leopards release) in that they are now user options. Should have been there for Leopards release but shows how tight it’s original release date probably was. Impressive how quick the update is to download when you think about how many Mac users are downloading it right now. Any good backup software for Windows? Need something to back up work laptop. New Sony Ericsson Xperia looks like a great phone. Loving that screen resolution. FancyZoom – nice effect for images that’s easy to add. Frustrated with the amount of sites blocked at work. A well as the pron, torrents, e-mail, IM and normal stuff you’d expect it now extends to social networking sites (Facebook etc) and also Twitter, every hosted WordPress blog, anything to do with games and the playing/buying/reviewing off and some real oddball sites including some on Oracle. Bizarre, frustrating but I guess I’m at work and should be…working?